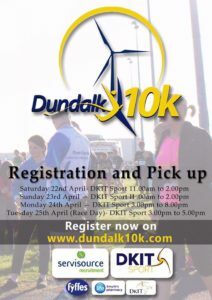 Athletes, running enthusiasts and novices across the country are getting stuck straight back into training this New Year in anticipation of the seventh running of the highly successful DkIT Dundalk 10k road race, taking place this April 10th 2019. This year the run is in association with DkIT Sport, Servisource Recruitment, Fyffes, Dundalk Retail Park and Intact Software. DkIT are again a major sponsor and organiser and the race route will begin and end at the DKIT Sport facility (See Route). The distinctive and recognisable route has become a favourite among runners in the North East as it takes you through historic town of Dundalk at the gateway to the Cooley peninsula. Runners, joggers and walkers of all levels of fitness are welcome to take part and raise funds for their favourite charity. Last year over 900 people took part and the target for 2019 is to break the one thousand mark!! The run itself will take place at 7pm on Wednesday, 10th April 2019 starting and finishing at the new DKIT Sport facility. Number Collections: You can pick up your race number and t shirt at the following times. All collections will take place in DKIT Sport. Pick Up- late registration will also be available at these times. – Limited car parking will be available at DKIT Sport. This carpark will close off at 6.30pm and not reopen until 9.00pm. Our main carpark will be at Dundalk Retail Park so please use this. This is located very close to the start line. – We will be serving post race refreshments in DKIT Sport so please call in after the race. Goodie bags will also be available for collection here. – We will be starting a warm up for the race at 6.45pm. See below dates and prices for online registration. Registrations are now open for the 2017 Dundalk 10k Race. This year the race will start and finish at DKIT Sport which will allow for improved changing and warm up areas. We have also introuduced a 5k walk to cater for all participants. © Dundalk 10K 2014-2019 - all rights reserved..